that secures data transmission by using fiber optic transmission to provide immunity from EMI/RFI interference. transmission must be protected from electrical exposure, surges, lightning or chemical corrosion. in half duplex mode, range is 412m with 62.5/ 125μm fiber cables. 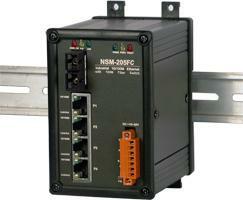 ANSM-205FC provides two power inputs that can be connected simultaneously to live DC power sources. If one of the power inputs fails, the other live source acts as a backup to automatically support the NSM-205FC's power needs.